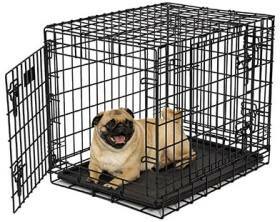 Crate Training your dog is acclimating your dog to a small enclosure so that your dog feels comfortable in the crate. Many years ago on a trip I made to the USA, I came across these strange people that kept their dogs in crates a lot, cages really that looked like a Cockatoo cage. I at first thought how strange is that, but back then my dogs were rarely allowed inside our house. I could see the benefits just as clear as I could see the benefits for caging a Cockatoo. Without a cage many Cockatoos would eat your house! but what about the poor dog caged in there? 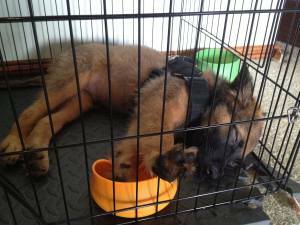 Is Crate Training your dog just another form of cruelty? I wanted to put forth my view on Crate Training and cover things like, how long, why, when it is not useful, when it is a must and what I think the benefits are. First, do I think Crates are cruel? without a doubt I say no of course not, but of course there are some guidelines I go by to make sure I am not crossing that line. The first thing I do when I get any dog is crate train them. My dogs are in crates inside my house, I could just use a bed in the corner after crate training was proofed and the dog stopped thinking my house was a play area and toilet, but with young children in my house, crate training is a better option because when their friends come over, I can crate the dogs and other peoples children will not do anything to my dogs they or I don’t like. Sure I could just put the dogs outside but do I really want to send that message, “any time someone comes over to my house the dog gets put outside“? Next is that, I want the crate to be a great place where the dog feels comfortable and relaxed, I do this by using positive reinforcement associations with the crate. Yes this means feeding my dog in the crate, treating my dog when he enters the crate, praising my dog for going in the crate and any time I walk by I see my dog either go in or relax in the crate I initiate reward through praise or food. I allow my dog to rest in the crate after heavy exercise and sleep in there too which he considers positive. I do not crate dogs new to crate training for more time than they can manage comfortably. Meaning if I start with a dog that might be used to living inside a persons home, I set up the crate and secure the door in the open position. I allow the dog to get used to the new thing in the house and throw treats in there a lot until the dog is totally comfortable with the crate. Then I will give the dog a bone or a slow release food toy like a Kong Stuff a Ball and when the dog goes into crate to eat it, I close the door. If the dog spits out the food toy and wants to get out, I take the food toy and put in the fridge and place the dog in an alone time out place like the laundry for ten minutes. Once the dog is quite I bring him back into the crate and give him the food toy again. They are mostly quiet after this. Once they have eaten all the food I will open the crate door again and allow them to come out, but these rules get slightly tighter as time goes by and I will then crate the dog longer; usually up to 2 hours although on super busy days my dogs could hit the 4 hour mark. The procedure is different with a puppy as I also use an exercise pen in combination with the crate. This is a debate that has no real answer other than, it depends. My dogs like many dogs sleep in a crate over night, they are toileted before we go to bed (11pm perhaps) and they are let out again in the morning (7am? perhaps), so 8 hours. They are crated for 2 hour periods sometimes throughout the working week, with toilet, play, training breaks occurring in between. My dogs are very comfortable in their crates and go in there by choice. person will have to consider. Time is increased over a few weeks in my program in most cases. You will come to realise that dogs do love their crates and they can be in them for quite a while, but don’t take advantage of that; be aware that all things in life need balance and even too much of a good thing is not good. Dogs can be crated for 8 hours plus whilst your at work, whether they should be is another question. Dogs need exercise, rest, rules, boundaries, satisfaction, play, engagement and many other things all in moderation. If you choose to crate your dog/s throughout the day, I would be more interested to see what the other 16 hours a day looked like. You can over and under anything, food, play, exercise, discipline and interaction are not excluded from excess. I can’t answer how long is too long because it is something that each individual dog and owner need to decide on. I have seen people crate their dogs for 22 hours a day, and the other 2 hours was split into 5 or 6 walks on a leash, sounds a lot but that is what will happen if your dog injuries an ACL or similar. To me 22 hours a day is crazy unless the dog is injured or recovering, and whilst people will then say “my dog sleeps 22 hours a day anyway“, this is a choice your dog may make whereas the crate door locked means no choice. I have covered this pretty well I think in my article “10 reasons to crate train your dog“, but know that many dogs that I see for behaviour problems benefit hugely from crate training. Whether your dog is over excited when visitors turn up or aggressive, the crate is a great option. Maybe your dog steals food, counter surfs or raids the bin, well one of the first steps in extinguishing that behaviour is preventing rehearsal. There are many people that will solve all these problems without using a crate, and I can too, but if your dog does ever injure itself and needs to be “kept quiet” as vets say, you may find that getting your dog calm in crate when he or she is in pain after injury or surgery quite a challenge as the associations made will be pain not positive. When I take my dog out and let him off leash, you know who he races off to play with? Nobody, this off leash time is his opportunity to gain access to me, the games he likes and the rewards I offer. Maybe your dog is just like that when in your house but has no value for you when your out? Remember my dog does not have unlimited access to me inside my house, so he takes advantage of the time he does have access, everywhere else. Some dogs almost maul you when you go out into your backyard each day, why? Because they never spend time with you just relaxed. The crate creates this relationship too and stops the overexcited crazy dog at the back door. Does this mean my dog never spends time with me inside the house? no of course not, but it is on my terms. Right now I would like to share with you a load of pictures I have of all the things my dog has destroyed in the house, but of course he has not destroyed a thing, not because a Balgian Malinois wouldn’t, it is because he doesn’t have free access to the house, any time he is out I am supervising him. When a dog is in a crate it has no option to engage physically with other people, dogs or valued items, which is a great starting point, but over time although I don’t close the door in the beginning, I do later on and then I leave the door open. My dog Venom sleeps in his crate at night, the door is wide open and he will only come out when I call him or someone crashes through the front door. The later ends badly for those that wish to raid my house. The important message here other than “don’t raid my house” is, the door open helps a dog develop impulse control, all the options once denied the dog when the door was closed now are all available, but the dog chooses to say “no thanks“. Dogs with impulse control work more efficiently under distraction than dogs that don’t. Dogs that can control themselves around stimulus are better equipped to work better when other stimulus is present. If I had a dog that perhaps suffered from storm phobia, separation anxiety or another psychological problem that meant the dog would self harm or have a meltdown in the crate, I would never crate this dog when I felt that the trigger (storm, me leaving etc) may occur. That is not to say that I would not crate train this dog, nor am I saying that I would never put the dog in a crate when these triggers were applied, but I would really spend a lot of time acclimating a positive feeling to the crate before I would crate the dog and leave. In 99% of cases I want the crate in the most common “living space” of the home. Somewhere that when I am relaxing watching TV or have visitors etc, I am in the same room as the dog. I can then talk to my dog, see if he is relaxed, access him if I like etc. and he feels like he is part of the family. He gets to watch our lives unfold and learns to accept all that we do in our house without getting overstimulated or trying to involve himself and only getting into trouble. This makes him welcome in my house as often as I am in there, with no down sides. That 1% of dogs that I put the crate in a room other than the main living space of the house may be removing some dependency as I might be helping the owner with separation anxiety or a similar dependency issue; but this is not something for you to try, it is part of a comprehensive behaviour modification program I would prescribe individually to each dog and situation. I like to start with a solid construction crate for all dogs new to crate training, so what I am saying is, I don’t start dogs in soft crates. 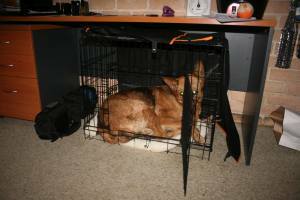 A wire crate or an Airline crate is the best way to start dogs, we use wire crates in our home with covers on them. Once crate trained then a soft crate becomes an option. We stock the Midwest brand of dog crate with the Anti Burst locking system on the doors. These are super easy to use and very secure. Yes, very much so; the crate needs to be big enough so that your dog may lay on his or her side outstretched without restriction; but too big might turn the crate from a calm relaxing place to a play pen. Our crate training program explains how to measure your dog for a crate, and our crates come with divider panels so that if you buy the crate your pup will grow into, it can be the right size all throughout growth. That is perfectly O.K, this is not a “you must crate train your dog” article, in just about every situation I use a crate for I can train something else in place, but the crate is a very helpful discipline to consider. I too thought it was a strange idea until I investigated it thoroughly and looked at what use it could be to me, my dogs and my clients. If you would like to crate train your dog but don’t know how to start, send us an email and we will send you a crate training program written by me that will get your dog into a crate and loving it, stress free. As always, please share your comments and thoughts with us below, we would love to hear your experiences, good or bad. Them or they do it to her 1st so she then reacts. I have taken her to the off leash dog beach and she was fantastic, she was tense at 1st but relaxed after meeting a few friendly dogs, I also have 2 Maltese x shihtzu dogs 5 year old and 11 year old. Any help would be unreal. Hi Nicole, if you email our office on info@k9pro.com.au or call on 02 45 789 789 they can advise you of costs etc. I am trying to squeeze in another visit to Melbourne in 2015 so let them know you would like to get on that list.